At Walt Disney Parks and Resorts, we continually push the boundaries of creativity and innovation to deliver the best possible experience for our Guests. We’re always looking for ways to take what we do and do it even better. Over the past few years, we’ve devoted considerable time and resources to create a more immersive, more seamless and more personal experience for each and every Guest who spends time with us. I know there’s been significant speculation about these efforts among our fans, so we’re pleased to give you a glimpse into the work we are doing to take the entire Disney Guest experience to the next level. Some of these initiatives are more apparent and can already be seen by our Guests – like our interactive queues at Walt Disney World® Resort and the Enchanted Art on our cruise ships – while others are more behind-the-scenes and are focused on “how” visitors plan, access and enjoy their experiences with us. Over the next several months, we’ll be rolling out a collection of tools at the Walt Disney World Resort called MyMagic+ that will give Guests more opportunities to customize and personalize their entire visit. Like most people who visit Walt Disney World Resort, my family and I have our “must-do” attractions, and as the father of three boys, those attractions often end with the word “mountain.” Now, rather than dashing as a group, or even splitting up to gather FastPasses, imagine booking guaranteed ride times for your favorite shows and attractions even before setting foot in the park. With MyMagic+, Guests will be able to do that and more, enabling them to spend more time together and creating an experience that’s better for everyone. A major component of MyMagic+ is the new My Disney Experience website and mobile app, which gives Guests planning their trip the latest information on all Walt Disney World Resort has to offer. We know that some people like to plan every aspect of their Disney vacation in advance while others like to plan very little, letting their day unfold spontaneously. No matter where Guests fall in that spectrum, My Disney Experience gives them the flexibility to plan as much or as little as they’d like to create the exact Disney experience they want. They can book dining and other experiences and reserve times for their favorite attractions, shows and more through an enhanced FastPass system, FastPass+. Once they arrive, they can use their smart phones to spontaneously change their plans in the moment, exploring our parks at their own pace and getting the most out of their visit. Linking the entire MyMagic+ experience together is an innovative piece of technology we developed called the MagicBand (or Card). It will serve as a Guest’s room key, theme park ticket, access to FastPass+ selections, PhotoPass card and optional payment account all rolled into one. We’ve began testing certain aspects of MyMagic+ in Florida last month and the early reactions we’ve gotten have been fantastic. This collection of tools is another step forward in the ongoing evolution of our Guest experience, giving us even more ways to help friends and family create the unforgettable Disney memories that they want most. We’ll be testing, adjusting and adding features to MyMagic+ and My Disney Experience over time and will continue to make improvements based on our Guests’ feedback. We look forward to sharing more with you in the months ahead! Disney World’s Avatar Project – How Fans Are Taking It? The Official Ticket Center 12/20/2012 ~ It was Just a year ago, when we were acquainted with one of the most exciting Disney World projects. The animation empire Walt Disney Co. had announced its plans for an “Avatar Land” in the Animal Kingdom. The initial announcement came as a great relish for die-hard Avatar fans; had elevated their excitements to new heights. Indeed the very thought of James Cameron’s mysterious Planet Pandora and the amazing tall- blue natives – the flying dragons is awe-inspiring to many. And with Disney’s proclamation of bringing the actions of Pandora to life is seen as an unbelievable experience in the offing. However, after months of no hard news or any official disclosure from Disney on this matter fans are losing their patients now. The only thing that people heard about the project is the initial announcement and few rumors about some kind of mysterious “flight simulator ride”, which is probably what Disney is planning for the new Avatar Land project. Also there was a strange sight of a “dragon prototype” spotted by few others, who tried to connect it with probably the Disney World’s version of an Avatar Dragon. Nothing is clear so far about the schedules of the project and neither there is any real information about the kind of attractions the project will have. People begin to believe that the Disney-Imagineers are either very secretive about the project and its nature or the project is not in their list of important Plans at all. There is also the sense that the anticipations of Avatar Land will get crushed forever. Some are of the opinion that the project is heading to a complete shut down owing to various uneasy-circumstances that surface, such as creative differences between Disney-Imagineers and Cameron. Also the speculations about Cameron’s Avatar sequels (running off-schedules, including fourth Avatar might not be in the production at all) send a dis-heartening signal. Moreover, given the news of other major upcoming Disney plans, including “Cars Land” and “Star-Wars” expansion (following the recent Lucasfilm Acquisition by Disney) the hopes of getting an Avatar Land soon is becoming a distant cry. However, I suspect that the prospect of an Avatar Land in Disney Animal Kingdom is still alive and going great. According to the news article published at IGN Entertainment – “Update on Walt Disney World’s Avatar Land” dated December 7, 2012 it seems Disney-Imagineers are secretly excited in taking forward the project in a grand style. They are all set to take on the challenges of bringing the world of Pandora and its characters to life, including other very rich, magical places of the upcoming sequels of James Cameron. But when we will have the first- real Pandora experience and rides is still a mystery and I believe the fans will have to bear a long wait for this until Disney thinks otherwise. For discounts on Disney tickets, and other Orlando theme park tickets, call us toll free at 1-877-406-4836 at The Official Ticket Center. With an unprecedented two Dumbos aloft, guests get to their flights faster aboard one of the park’s most iconic attractions. Connecting the two Dumbos, a new “big top” area allows guests to immerse themselves in circus lore in a series of fun, interactive experiences before a spin with their favorite circus elephant. Magic Kingdom guests blink back in amazement at the scene: not one, but two colorful Dumbos spinning through the sky above Storybook Circus. To the delight of fans of the beloved Dumbo, the Flying Elephant attraction, a second Dumbo flies alongside. 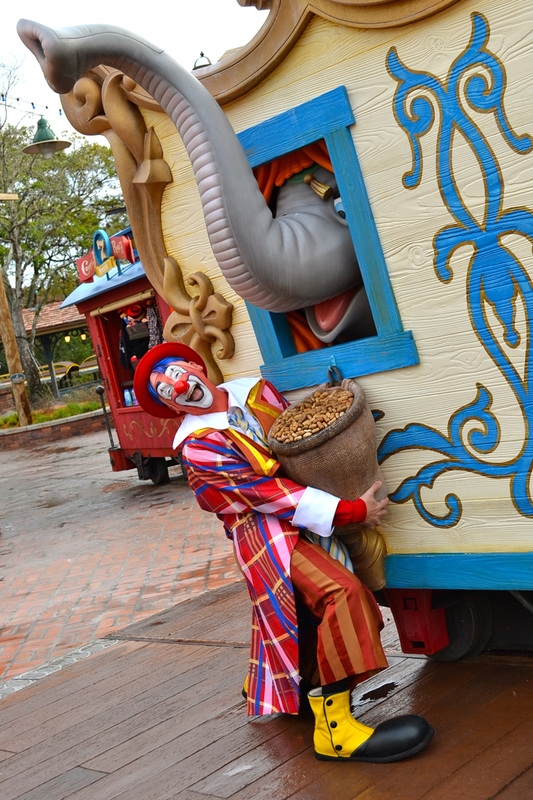 The playful pachyderm is joined in Storybook Circus by the Barnstormer Coaster re-themed to the Great Goofini, the Casey Jr. Splash ‘N’ Soak Station water play area and the Fantasyland Train Station — all part of the multiyear, largest expansion in Magic Kingdom history. There’s more to come as the expansion of the New Fantasyland – nearly doubling in size — continues at Walt Disney World Resort. In fact, so many more attractions are coming on line later this year that Dec. 6, 2012 has been set as the Grand Opening of Fantasyland. Previews are currently taking place. Under the Sea ~ Journey of the Little Mermaid, a major attraction where guests will travel with Ariel and her friends through their exciting adventures above and below the waves – all against a musical backdrop of songs from the film. The new attraction combines the enduring appeal of a classic Disney “dark ride” with wonderful technological innovations to offer guests a personal journey into the scenes of the film. Adventurers will feel as if they are descending below the ocean’s surface. Once “under the sea,” guests will find themselves immersed in the story of “The Little Mermaid,” sharing Ariel’s adventure through a magical cast of characters and a captivating musical score that will entice everyone to sing along. The fun continues at “Ariel’s Grotto,” a meet-and-greet with the mermaid heroine herself. The castle of the Beast stands majestically upon a hill across an old stone bridge from Ariel’s new home. The Be Our Guest Restaurant will feature a lavish dining experience in the elegant ballroom, gallery, and mysterious “West Wing” of the castle. With seating for 550, this magnificent facility will offer “great food fast” service by day and full-service table dining in the evening. Nearby in Belle’s Village, guests will find the rousing Gaston’s Tavern and Bonjour! Village Gifts. “Fantasyland is a place where a very special kind of memory is made: where children just old enough to understand the moment come in contact with princesses and heroes and meet their most beloved friends,” said Meg Crofton, president, Walt Disney Parks and Resorts Operations, United States and France. Located in the Castle Courtyard in the center of Fantasyland, Princess Fairytale Hall will be the new home for visiting royalty in the Magic Kingdom. The castle-like entrance will feature walls of stone and stained glass windows, opening up into a large gallery – an airy space with a high ceiling, where portraits of the Disney princesses adorn the walls. When it’s time for their audience with a princess, guests will proceed to elegantly finished rooms to meet Aurora, Cinderella and other Disney princesses, such as Tiana and Rapunzel (2013). The Seven Dwarfs Mine Train will take guests on a rollicking, musical ride into the mine “where a million diamonds shine.” The coaster will feature a first-of-its-kind ride system with a train of vehicles that swing back and forth, responding to every twist and turn of the track. The journey will be accompanied by music from the classic Disney film and animated figures of Snow White and the Dwarfs (2014). The Official Ticket Center 12/11/20102 – Universal Orlando Resort’s Holidays celebration is where families create holiday memories to last a lifetime. With one-of-a-kind holiday traditions that all ages can enjoy, it’s the only place where guests can come face-to-face with The Grinch at Grinchmas, watch majestic Macy’s balloons wind through the streets and hear Christmas music sensation – Mannheim Steamroller – perform beloved holiday classics. Beginning Dec. 1 and running through Jan.1, the Holidays at Universal Orlando offers incredible holiday experiences at both theme parks. At Universal’s Islands of Adventure, families will be filled with holiday cheer as Grinchmas comes to life throughout Seuss Landing. Guests can watch the heartwarming live show, “Grinchmas Wholiday Spectacular,” featuring The Grinch and the Whos from Who-ville accompanied by an original musical score by Mannheim Steamroller. Guests can also meet The Grinch and the Whos and on select dates, purchase and enjoy a special breakfast with the characters. At Universal Studios Florida, the Macy’s Holiday Parade will fill the streets every evening with the same larger-than-life balloons seen in the famous New York City parade. This year, the parade will include all-new Nutcracker and Mouse King “trycaloons” – tandem tricycles that appear to be pedaled by whimsical balloon characters from the popular holiday tale. Guests will also enjoy colorful holiday characters, fantasy-filled floats and a tree-lighting ceremony by Santa Claus. Returning this year with more concerts than ever before is Mannheim Steamroller – the masters of Christmas music with more than 40 million albums sold worldwide. The acclaimed musical group will take to the Music Plaza stage in Universal Studios eight nights this year to perform their memorable holiday hits for guests. Performance nights are Dec. 1, 2, 8, 9, 15, 16, 22 and 23. All theme park holiday entertainment – including Mannheim Steamroller concerts – is included as part of two-park or multi-day admission to Universal Studios and Islands of Adventure. On December 31st, guests can celebrate the New Year at one of the hottest parties of the year – Universal CityWalk’s New Year’s Eve celebration. This year’s electrifying event features a rockin’ concert by one of today’s top artists, access to seven of CityWalk’s high-energy nightclubs, all-you-can-eat gourmet cuisine and a midnight champagne toast. The Official Ticket Center ~ It just keeps getting better and better at the Walt Disney World Resort. 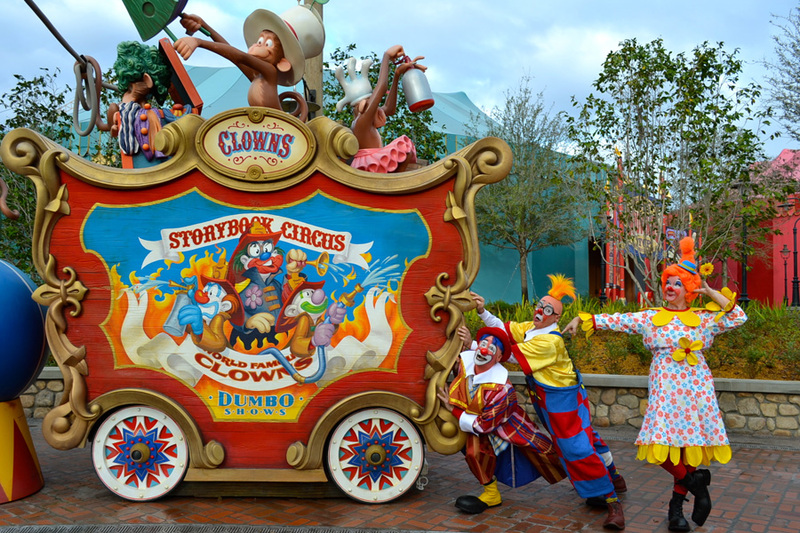 Ladies and gentlemen, children of all ages, New Fantasyland is proud to present the Storybook Circus Giggle Gang! What would a circus be without clowns? 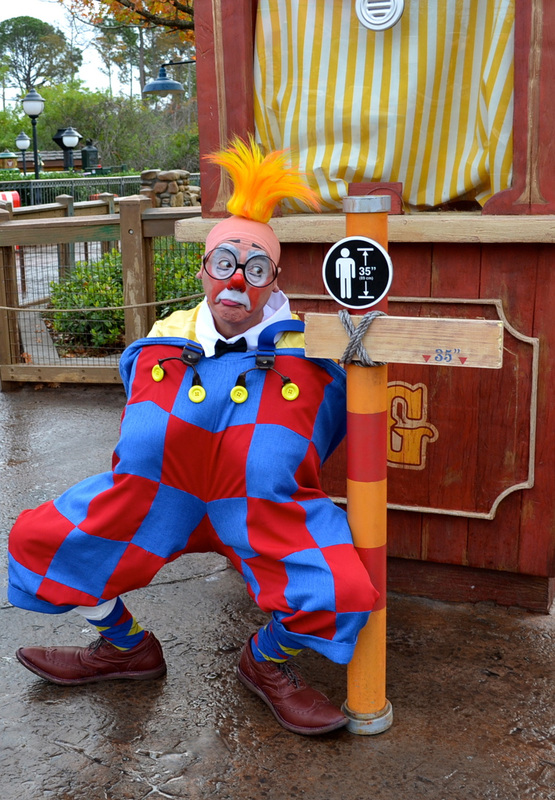 At Storybook Circus in Magic Kingdom Park, our masters of mirth tickle your funny bone with a whirlwind of wackiness. Just wait until you meet boss clown Chuckles Buffoon McMonkeyshine III and his protégés, Whinny Horselaugh and Snort. Together, they engage in circus shenanigans, from classic calamities to clown calisthenics. They’re sure to have you in stitches! Joining the Storybook Circus Giggle Gang is the Silly Saxtet, parading onto the circus grounds with their own unique twist on circus music standards, and featured clown Wowzer, a specialty performer who takes center ring and keeps his audience enthralled with amazing feats of thrills, chills and hilarity. 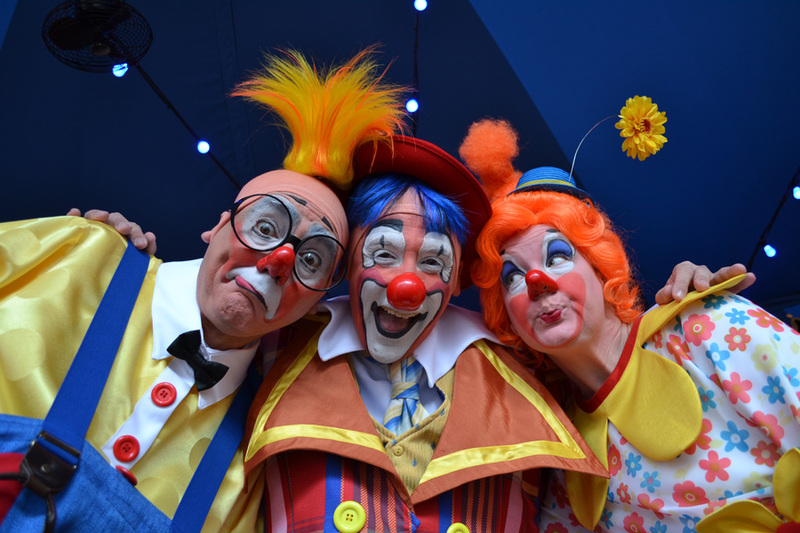 Inspired by everything from Walt Disney’s “Dumbo” to the music of Spike Jones, the Storybook Circus Giggle Gang also has its roots in the classic traditions of The Greatest Show on Earth. Several members of the ensemble are graduates of the famed Ringling Bros. and Barnum & Bailey Clown College. 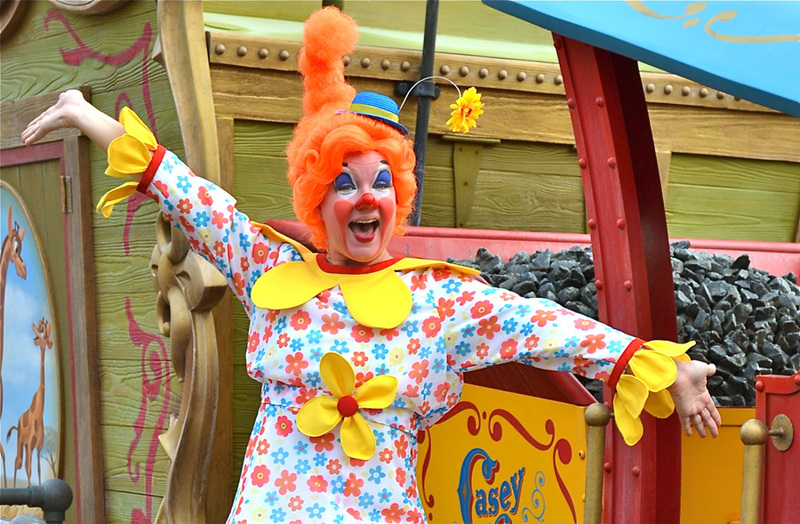 The Storybook Circus Giggle Gang debuts this week, as part of the grand reveal of New Fantasyland! Show Express – The best way to experience SeaWorld’s Christmas Celebration! The seasonal shows are one of the main highlights of SeaWorld’s Christmas Celebration. These entertaining performances truly bring the season to life, and now, SeaWorld Orlando is offering the best way to experience them all. New this year is Show Express which gives you special, reserved seating at all of SeaWorld’s Christmas Celebration’s shows: Shamu Christmas Miracles, O Wondrous Night, Clyde and Seamore’s Countdown to Christmas and Winter Wonderland on Ice. Along with reserved seating, you’ll receive front-of-the-line access to THE POLAR EXPRESS Experience, a classic holiday favorite at SeaWorld Orlando. Plus eat, drink and be merry as much as you’d like at participating restaurants throughout the park with All Day Dining Deal included. To remember your experience for years to come, you’ll enjoy a complimentary holiday photo from one of SeaWorld’s Christmas Celebration exclusive photo locations. Special discounts are available for Pass Members when booking through the Pass Member website. For more information about SeaWorld’s Christmas Celebration, please visit www.officialticketcenter.com. Ready to book your Show Express experience now? Call us toll free at 1-877-406-4836 TODAY! What’s Happening at The Walt Disney World Resort this Holiday Season? Whatever you have planned for your vacation, make sure you set aside time to see the Walt Disney World® Resort all decked out for the holidays. Besides all of the holiday favorites that are in store year after year thrilling guests from around the world, you will now also get the chance to experience the amazing expansion in the Magic Kingdom® Park – New Fantasyland! So, make sure to add the Park Hopper® Option to your ticket during these busy holiday times so you and your family will have the flexibility to “hop” around all four Disney Theme Parks. You can check out some of your favorite celebrities at Epcot’s® Candlelight Processional, the bright lights at The Osborne Family Spectacle of Dancing Lights at Disney’s Hollywood Studios™, and all of the new offerings just for the holiday season! One of the most beloved holiday traditions at Epcot® is the Candlelight Processional – a joyous retelling of the Christmas story by a celebrity narrator accompanied by a 50-piece orchestra and a glorious mass choir. November 23 – December 30, 2012 – World Showcase, America Gardens Theatre – 5:00, 6:45 & 8:15 p.m. If you could decorate Cinderella Castle for the holidays, how would you decorate it? This is the exact premise of Cinderella’s Holiday Wish and the Castle Dream Lights, a nightly holiday show and spectacle that lights up Cinderella Castle at Magic Kingdom Park with thousands of lights. It’s also one of my all-time favorite holiday offerings here at Walt Disney World Resort. Earlier this month, we decided to go behind-the-scenes with Creative Director Reed Jones to learn just what it takes to bring this show to life. Take a look! Showtimes may vary per night. The best way to know is to arrive early and pick up a Times Guide on your way in. That’s the best way to know where to be and when so you don’t miss a thing. Happy holidays! The Walt Disney Company agreed Tuesday to buy Lucasfilm in a stock-and-cash deal valued at $4 billion. The deal will make Lucasfilm owner George Lucas a significant shareholder in Disney, which will pay for the film company with $2 billion cash and around 40 million shares of its stock. The takeover will give Disney (DIS, Fortune 500) control of Lucasfilm’s blockbuster Star Wars franchise, which encompasses both filmed productions and a massive merchandising operation. Disney will also absorb Lucasfilm’s special-effects production business, Industrial Light and Magic. Kathleen Kennedy, current co-chairman of Lucasfilm, will become president of Lucasfilm, reporting to Walt Disney Studios Chairman Alan Horn. Lucasfilm employees will remain based at the company’s San Francisco headquarters. Lucas said he will continue to work as a creative consultant on Star Wars Episode 7, which is targeted for release in 2015. Executives from Disney and Lucasfilm plan to provide more details on the deal during a conference call Tuesday afternoon. We may not like it, but we’re getting accustomed to Christmas celebrations starting in November. Here are some of the Central Florida attractions taking a Yuletide head start. •Disney World hits the eggnog hard Nov. 9 with an array of holiday festivities. On that day, the Osborne Family Spectacle of Dancing Lights plugs in at Disney’s Hollywood Studios, and Mickey’s Jingle Jungle Parade steps off at Disney’s Animal Kingdom. It’s also the first day of Mickey’s Very Merry Christmas Party at Magic Kingdom (separate admission ticket required). •ICE!, Gaylord Palms’ elaborate ice-sculpture attraction, begins Nov. 10. This year’s theme is Merry Madagascar with characters again carved by 40 Chinese artisans. Returning are two-story ice slides and (brrrrr) 9-degree temps. Dress accordingly. •SeaWorld’s Christmas Celebration begins Nov. 17 with an ice-skating show, a seasonal killer-whale show, “Clyde and Seamore’s Countdown to Christmas” with sea lion stars, a Muppet stage show and “O Wondrous Night,” a stage show revolving around the Christmas story. Celebration nights also include a fireworks-and-fountains finale. •The popular Candlelight Processional at Epcot begins Nov. 23, the day after Thanksgiving, with actress Geena Davis as narrator. The event includes a mass choir and orchestra alongside the park’s Voices of Liberty as backdrop to the telling of the Christmas story. Other November narrators include actor Neil Patrick Harris and “The View” co-host Whoopi Goldberg.